For the record, Ms. Yu says she dislikes being compared with Dickinson, whom she has never read. In fact, her grounding in world literature is somewhat lacking, she said on a recent afternoon at her home in Hengdian. She now lives with her father in a newly built two-story house, a short walk from their old farmhouse. A recent village renovation razed most of the old buildings and moved residents into new housing, but her family home has been preserved as a tribute to a local celebrity. She shrugs off the fame and the labels usually applied to her as a writer: female, peasant, disabled. She claims to be indifferent to readers’ reactions. “There is little difference between me sleeping with you, and you sleeping with me. The poem was widely discussed online, with some condemning it as lewd, while others praised it for channeling the feminist voice of a woman taking the initiative to “sleep with” others. 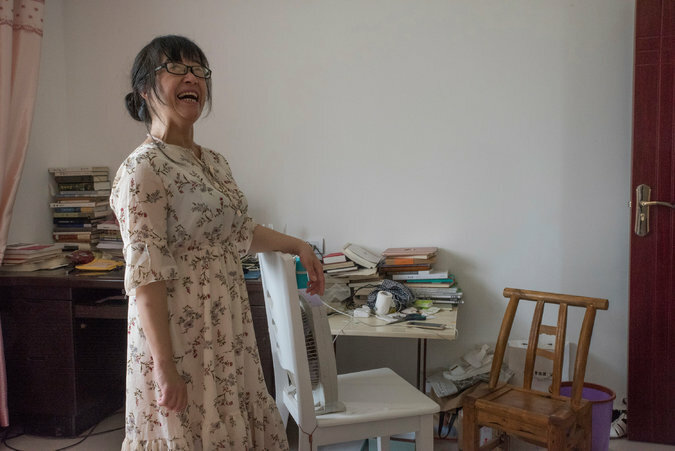 Born in 1976 in Hengdian, Ms. Yu never finished high school. At 19 she married a construction worker 12 years older, in a wedding arranged by her parents, who were concerned that she would never be able to care for herself. At 27, she began writing poetry. For years, she wanted a divorce, but her husband refused. One factor, she said, was that her husband, who often lived far from home as a migrant worker, had nowhere else to return to. Last year, after Ms. Yu received about $90,000 in royalties from her books, she bought a house for him, and the two divorced. Their son attends a university in Wuhan, Hebei’s capital. “My mother wasn’t happy at first, but she was all right later, because she saw I was really happy,” Ms. Yu said. Not long afterward, her mother died of cancer. Ms. Yu said of life after her divorce: “This is my best time. I feel great.” She is still scathingly self-critical, though. For the moment, she has her poems.